Sunshine State Sarah: "We mutually pledge to each other our Lives, our Fortunes, and our Sacred Honor"
"We mutually pledge to each other our Lives, our Fortunes, and our Sacred Honor"
Two hundred and thirty six years ago, a brave group of patriots signed their names to a document that would change the course of human history. These fifty-six men publicly declared their commitment to the "self-evident truths" that formed the foundation of our nation and which have continued to serve as a beacon of hope for all people around the world who have ever yearned to be free. 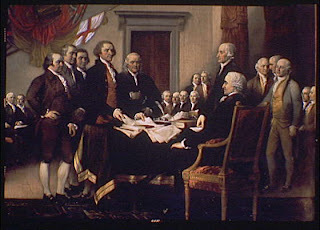 The final sentence of the Declaration of Independence is a promise among the signers, to "mutually pledge to each other our Lives, our Fortunes, and our Sacred Honor," and many of them and their fellow patriots did in fact sacrifice their lives and fortunes in service to our country. No loss of life or money could ever diminish the honor of these heroes, and it is that honor that we celebrate today. Over two centuries ago, fifty-six men put their lives on the line to preserve and protect the freedoms that are the God-given unalienable rights of all free people. Today, as I think back about the incredible amount of courage it must have taken to publicly sign their names to this document, I cannot help but think that the best way to honor this courage is for each of us to consider making a similar personal pledge to our fellow Americans. This is not a year to sit on the sidelines, not a year to watch from the bench. "The most important election of our lifetimes" may start to sound like a cliche but it increasingly seems to be true. What can you do that will help ensure that these freedoms continue to be part of the American legacy? Can you volunteer a Saturday afternoon to knock on doors for a candidate? Can you take an evening to attend a candidates' debate so you can be certain you are an informed voter? Can you help register new voters in your county? Can you write a letter to the editor of your local newspaper? Can you donate $5, $10, or $20 to candidates who you support? I think we can do all these things, and more. No, let me say it this way: I think we must do these things. I hope you agree. May God continue to bless our great nation, and to bless you and your families as well. A very Happy Independence Day to all of you. UPDATE: Don't miss The Volokh Conspiracy's excellent discussion of the history and meaning behind the words in the Declaration of Independence. good post. better than some of the meaningless junk I'm seeing from many of the politicians today. maybe Sarah should run for office!